The Outlook plug-in for the Nextiva App provides integration between the Nextiva App desktop client and Microsoft Outlook. The OL2016 plug-in can only be installed by an administrator. plug-in, the Nextiva App needs to start before Outlook. For logging to work normally, the Nextiva App needs to start before Outlook. changes to take effect. This should rarely be needed. If Outlook is closed while the Nextiva App is running, you must restart both Outlook and the Nextiva App for the Outlook UI to behave as expected. Installation for the Outlook plug-in is integrated with the installation (new and updates) of the Nextiva App. Click one of the links below to install the Windows version of the Nextiva App. 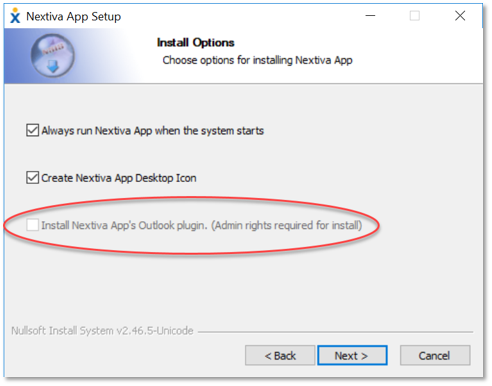 To include the Outlook plug-in, you must select the Install Nextiva App’s Outlook plugin checkbox in the installer (Figure 1-1). NOTE: If Outlook is upgraded, the Outlook plug-in must be re-installed because the plug-in uses different files based on the version of Outlook. NOTE: Select the “Install for all users” option during installation if previous installation was performed with that option selected. To uninstall the Outlook plug-in, uninstall the Nextiva App. If you use Microsoft Exchange with Outlook, you need to configure the SIP (Session Internet Protocol) address for each contact. You do not need to configure the SIP address for SMTP-based accounts, such as Gmail. URI (Uniform Resource Identifier), IM&P (Instant Messaging and Presence) address, or Email field in the Nextiva App. Consult your Microsoft Exchange or Active Directory administrator. The contact presence status can be available (green), away (yellow), busy (red), or offline (white) (Figure 1-2). NOTE: You must be signed in to the Nextiva App for the presence to be displayed. 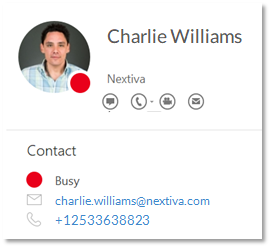 Presence is shown only for contacts that have a valid SIP address (for Microsoft Exchange users) and that are listed in your Nextiva App contacts list. You can right-click a received email to view the context menu that lists the options to Chat, Call from App, Call from Phone, and Video Call with the sender (Figure 1-3). You can also access the same options from the context menu when you right-click a contact in your Outlook contacts list (Figure 1-4). NOTE: The Chat option is only available for contacts that are listed in the Nextiva App. The Call options are available to all contacts as long as they have a valid phone number. The same contact actions, displayed as icons, are also available on the contact card (Figure 1-5). 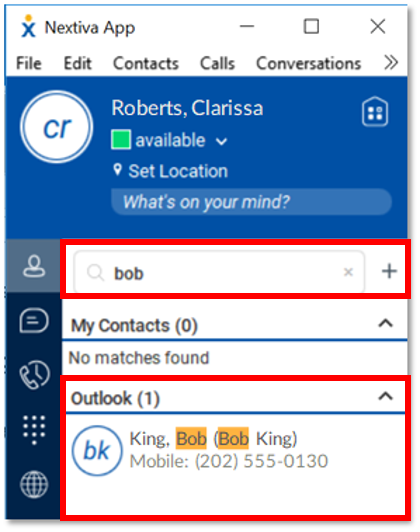 You can call any of the phone numbers listed on the contact context menus and on the contact card in Outlook. NOTE: You cannot call phone numbers stored in an Active Directory (AD) or Global Address List (GAL). You can call only numbers that are stored in the local Outlook contacts list. Outlook integration allows you to search the Outlook address book from the Nextiva App (Figure 1-6). However, searching Outlook will not return Distribution List objects (Contact Groups) or contacts without any communications capabilities (i.e. phone number or email address). Right-click the contact and select New Contact to add it to your Contacts list. With Outlook integration, Outlook calendar appointments and meetings trigger automated contact presence changes. Presence status in the Nextiva App is automatically set to meeting (red) when an appointment or accepted meeting starts, and there is no ongoing call (Figure 1-7). Consequently, contact presence in Outlook is automatically set to Busy (red) (Figure 1-8 and Figure 1-9).